Landers Frary & Clark was around from Mid 1800s until 1965. This iron was made around 1925 in New Britain Connecticut. They made several irons of this type with varying designs. They raised the bed off the counter to keep heat from getting the counter hot. The base also catches the drips for easy cleaning. A very pretty scroll design on the top edge. 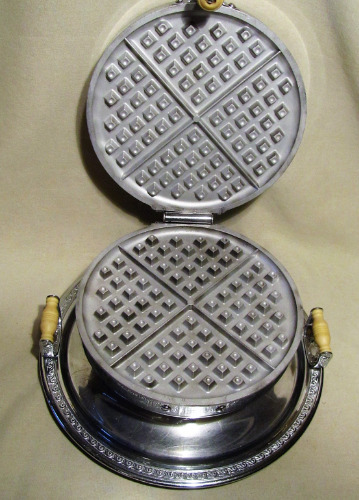 This was one of their top of the line waffle iron in this era (late 20's to 30's) and this one sold for $17.50 in 1931; pretty big investment for the depression era. (It would translate to about $200 + today). Its a 10 1/2 inch model making a 7 1/4 inch waffle. Grids are 1/4 inch for a 1/2 inch thick waffle. No thermostat but it holds heat well and cooks great. They did put a heat indicator that slowly extends out the hotter the iron becomes. Under the name "Universal" LF&C was noted for exceptional craftsmanship and this model is no exception. White "Bakelite" style handles add a little more style and are positioned well to keep your fingers from getting burned. A brand new cord set, re-wired and plates ready to be seasoned, this iron will not only look good but will make fantastic waffles. Its 660 watts, 110 - 120 volts AC (its wired in series). 10 1/2 inch handle to handle, 10 1/2 inch base and 5 3/4 inches high. It comes with a new cord and full instructions for seasoning, cleaning and using.